An unrepentant Rory McIlroy insists he is unconcerned by criticism of his plan to play just two European Tour events next season. McIlroy, who must play four European Tour tournaments outside the majors and World Golf Championship events to be a Tour member, currently only has two on his schedule and could even miss the Irish Open, an event he has hosted for the last four years. 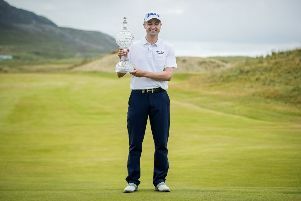 Former Ryder Cup captain Paul McGinley, who has succeeded McIlroy as host of the Irish Open at Lahinch in 2019, wrote in a column for Sky Sports that the possibility was “very disappointing” and that he found it “hard to understand”. But speaking after an opening 69 in the DP World Tour Championship in Dubai, McIlroy said he would accept causing a stir if he could end his four-year winless streak in the majors. “Geez, I’d cause all the stirs in the world if I go back to winning majors,” McIlroy said. “Everyone has to look out for themselves and next year I’m looking out for me. “At the same time, I don’t have to make a decision on it. I didn’t say that it was a definite. It’s up in the air. I don’t have to make a decision till May. We’ll see how it goes. If McIlroy does indeed give up his membership in 2019 he would be able to rejoin the European Tour in order to be eligible for the 2020 Ryder Cup, although a regulation introduced in January 2017 would prevent him being a captain or vice-captain in the biennial contest. “It’s 20 years away,” the 29-year-old added.